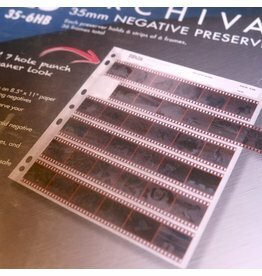 Printfile 35-6HB archival negative sleeves for 35mm film. Holds 6 frames x 6 rows for a total of 36 frames per sheet. Pack of 25 sheets. Printfile 35-6HB negative sleeves for 35mm format. 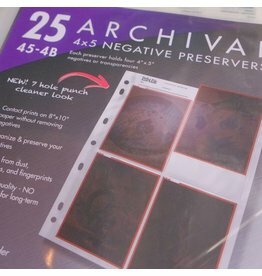 Printfile 45-4B negative sleeves for 4x5 film. Each sheet holds 4 negatives. Pack of 25 sheets. Printfile 45-4B negative sleeves for 4x5 format. 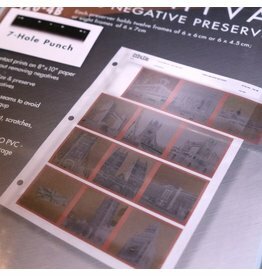 Printfile 120-4B archival negative sleeves for 120 film. Each sheet holds 12 frames of 6x6, 8 frames of 6x9, 16 frames 6x4.5. Pack of 25 sheets. Printfile 120-4B negative sleeves for 120 format.